Astonishing Fun for Early Learning Centers! Mr. Pitts Specializes in Entertaining Even the Youngest Audiences! The Astonishing Mr.Pitts came to the facility I work and performed for our preschoolers. Not only were the children engaged and entertained the entire time, the staff members were also captivated by the wit, whimsy, and sheer magic that came with this show. Dave Pitts is polite and funny, and this show is a delight for all ages. Best show for good wholesome entertainment….I would highly recommend The Astonishing Mr.Pitts to anybody looking to entertain their students or party guests. Mr. Pitts uses amazing magic tricks that even the youngest audiences can understand and enjoy! Fluffy the Magic Bunny keeps peeking during his magic trick! 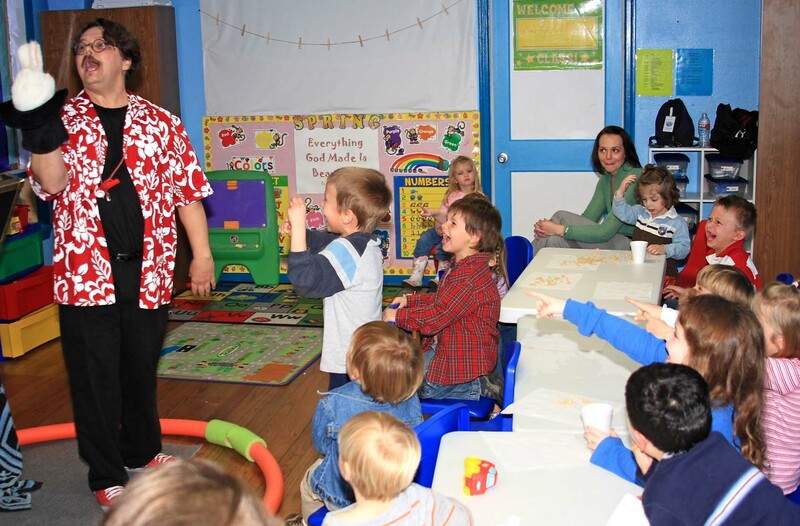 Cute and funny puppets bring lots of laughter and fun to early learning center presentations! Mr. Pitts uses fun and unusual instruments to add music to his presentations. 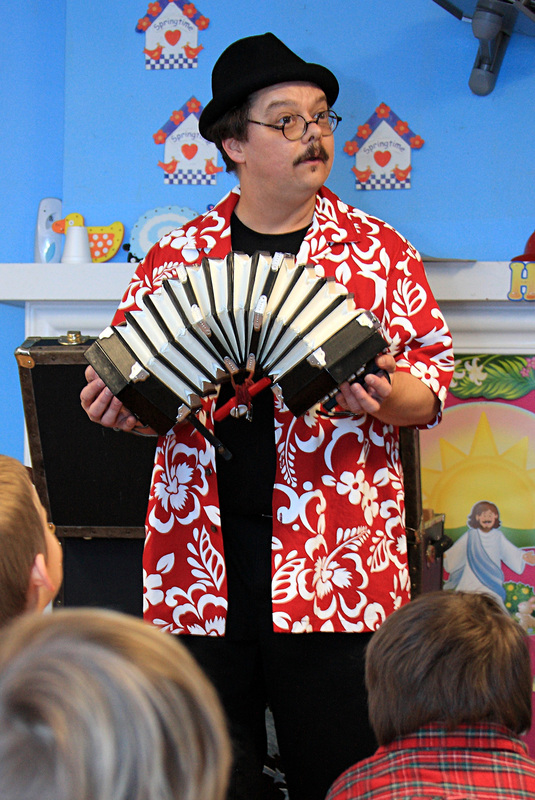 David Pitts is one of very few children’s entertainers anywhere who can truly entertain the youngest audiences. Using age appropriate magic, hilarious puppet characters, music, and an amazing understanding of what even the youngest of children find funny, plus an uncanny ability to connect and reassure, Mr. Pitts can entertain children as young as eighteen months on up! With a wide variety of kid friendly puppet characters and magic, he can adapt his presentation to fit a wide age range and a variety of themes! 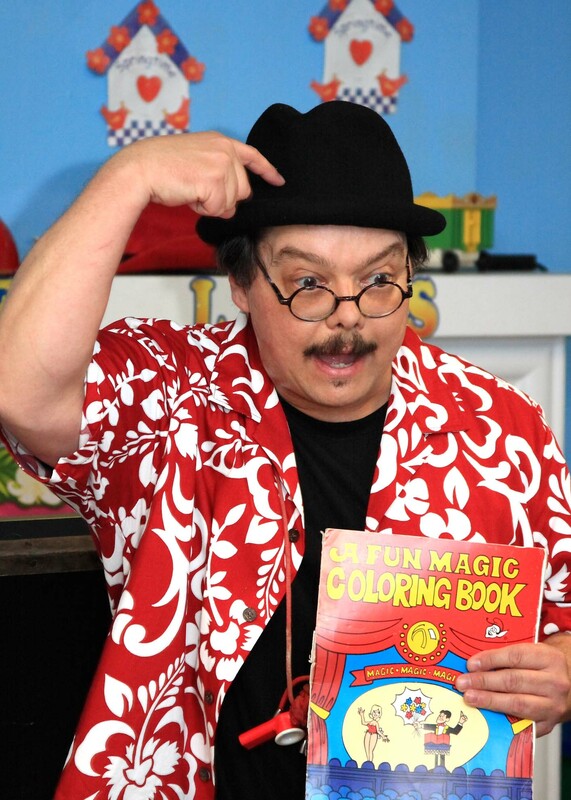 Mr. Pitts can bring one of his fun and amazing presentations to your child care center, day care, early learning center or pre-k. His presentations are 35-40 minutes long and all feature funny puppet characters, amazing magic tricks, music, audience participation and plenty of laughter and fun. Contact Us Today to Book a Performance or for More Information About Our Day Care Magic and Puppet Programs!